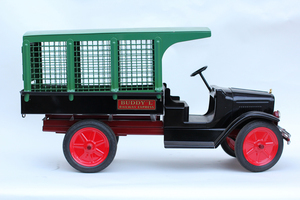 Buddy L Railway Express Truck, reproduction. 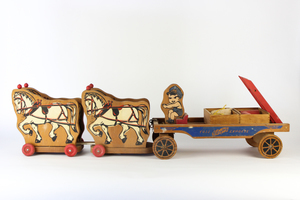 Dimensions: 13"h x 26"l x 9"w. This truck is made of pressed steel with Firestone rubber tires. The steering wheel works and turns the wheels on the axle. 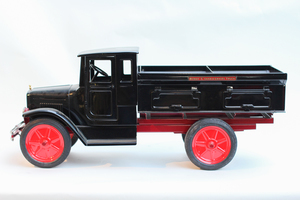 It is black with red detailing and green caged trailer with a working back door with lever. 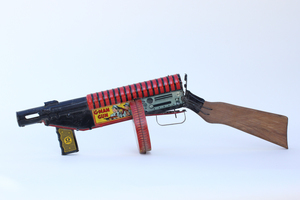 It is detailed with a license plate on the front end with the number 35407. 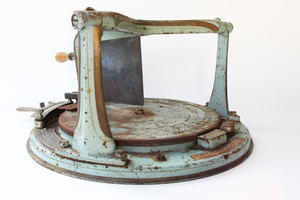 Processing and shipping within the continental U.S. $75.00 plus 1.5% replacement cost insurance. 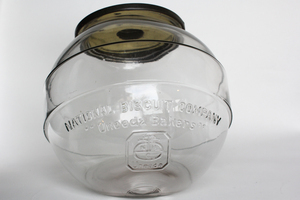 National Biscuit Company "Uneeda Bakers," counter display glass jar, embossed with the company's name and the Uneeda Bakers logo. 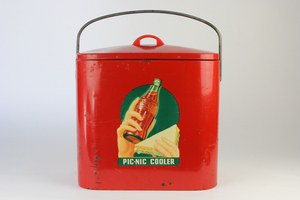 The jar has a tin lid with a bracket used for displaying different prices. 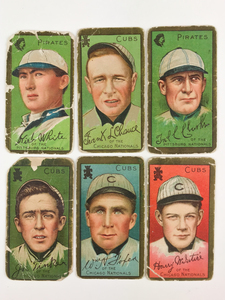 Dimensions: approximately 9" in diameter and 10" tall. 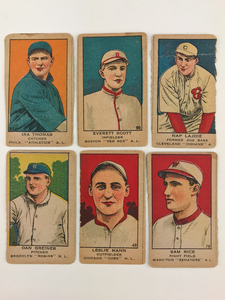 Processing and shipping within the continental U.S. $40.00 plus 1.5% replacement cost insurance. 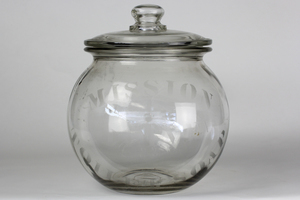 Antique round, glass display jar that reads "Mission Olive Toilette Soap," in slightly opaque white letters. 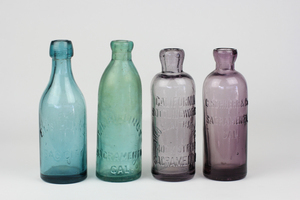 The jar also has a glass lid with a little knob. 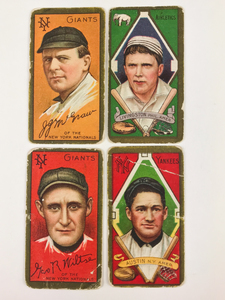 Dimensions: approximately 9" in diameter and 11 1/2" tall (including the lid). 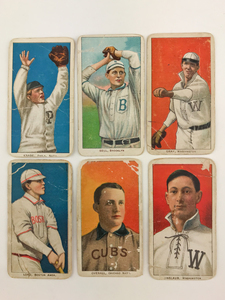 Processing and shipping within the continental U.S. $40.00 plus 1.5% replacement cost insurance. 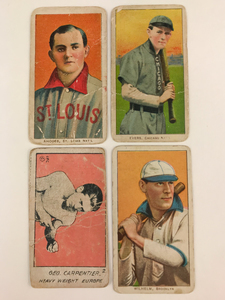 Six 1909-1911 T206 Sweet Caporal baseball cards comprising: 1) Otto Knabe 2) George Bell (hands above head) 3) Dolly Gray 4) Harry Lord 5) Bob Unglaub 6) Orval Overall. Processing and shipping within the continental U.S. $25.00 plus 1.5% replacement cost insurance. 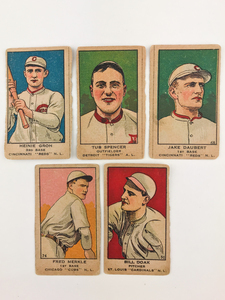 Six 1909-1911 T206 Sweet Caporal baseball cards comprising: 1) Lucky Wright 2) Rube Waddell (throwing) 3) Rebel Oakes 4) Jake Atz 5) Fred Tenney 6) Harry Gasper. Processing and shipping within the continental U.S. $25.00 plus 1.5% replacement cost insurance. 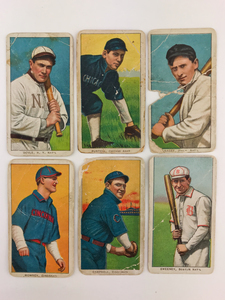 Six 1909-1911 T206 Piedmont baseball cards comprising: 1) Neal Ball, New York 2) Sam Crawford 3) Birdie Cree 4) Jimmy Dygert 5) Vive Lindaman 6) Miller Huggins (hands at mouth). Processing and shipping within the continental U.S. $25.00 plus 1.5% replacement cost insurance. 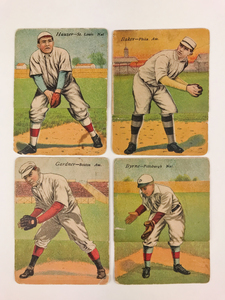 Six 1911 T206 Caporal baseball cards comprising: 1) Larry Doyle (with bat) 2) Bill Sweeney 3) Mike Mowrey 4) Sherry Magee 5) Billy Purtell 6) Billy Campbell. 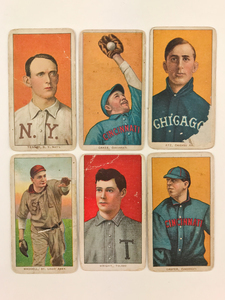 Processing and shipping within the continental U.S. $25.00 plus 1.5% replacement cost insurance. 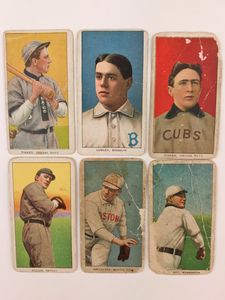 Six 1911 M116 baseball cards comprising 1) #102, Tris Speaker 2) #75, Frank Baker 3) #29, Bob Shawkey 4) #113, Casey Stengel 5) #57, Max Rath 6) #98, Jimmy Ring. 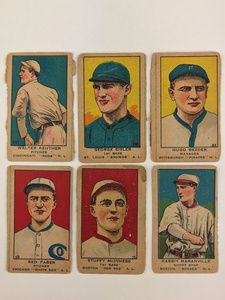 Processing and shipping within the continental U.S. $25.00 plus 1.5% replacement cost insurance. 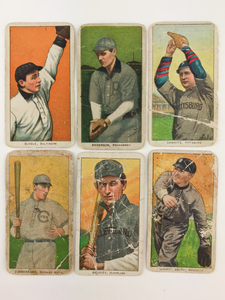 Four 1911 T201 Mecca Double Folders baseball cards comprising: 1) MATTERN/GRAHAM 2) LAPP/BARRY 3) THOMAS/COOMBS 4) JOHNSON/STREET. Processing and shipping within the continental U.S. $25.00 plus 1.5% replacement cost insurance. 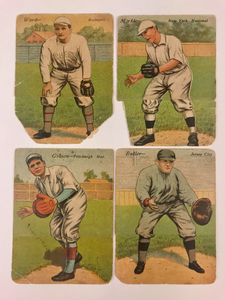 Four 1911 T201 Mecca Double Folders baseball cards comprising: 1) LEACH/GIBSON 2) ABSTEIN/BUTLER 3) WILLSE/MARKLE 4) FOSTER/WARD. Processing and shipping within the continental U.S. $25.00 plus 1.5% replacement cost insurance. 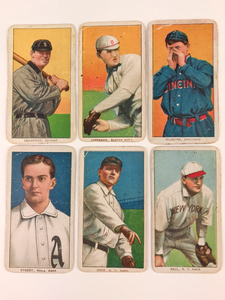 Six 1911 T205 Gold Border baseball cards comprising: 1) Harry McIntire 2) W.M. 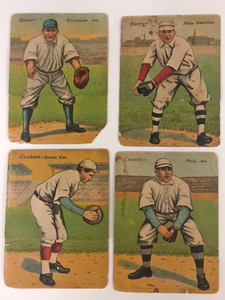 A. Foxen 3) Joe Tinker 4) Kirb White 5) Frank Chance 6) Fred Clarke. Processing and shipping within the continental U.S. $25.00 plus 1.5% replacement cost insurance. 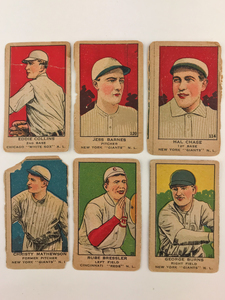 1919 W514 baseball cards comprising: 1) #25, Leddie Collins 2) #72, Christy Mathewson 3) #28, Rube Bressler 4) #24, George Burns 5) #114, Hal Chase 6) #120, Jess Barnes. 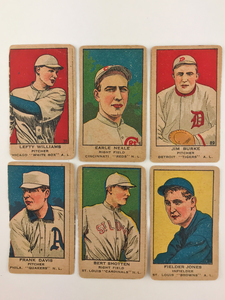 Processing and shipping within the continental U.S. $25.00 plus 1.5% replacement cost insurance. 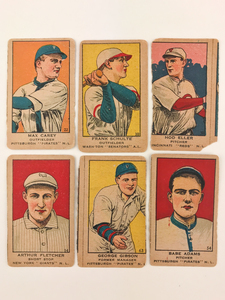 Six 1919 W514 baseball cards comprising: 1) #38, Hod Eller 2) #22, Max Carey 3) #10, Frank Schultz 4) #63, George Gibson 5) #14, Arthur Fletcher 6) #54, Babe Adams. 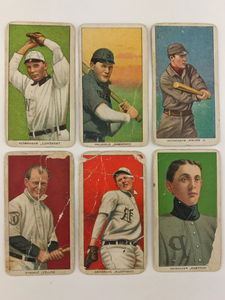 Processing and shipping within the continental U.S. $25.00 plus 1.5% replacement cost insurance. 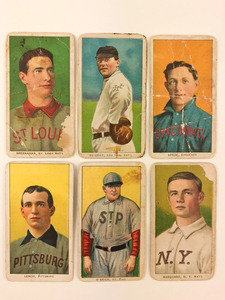 1919 W514 baseball cards comprising: 1) #20, Stuffy McInness 2) #69, Red Faber 3) #21, Rabbit Maranville 4) #108, Walter Reuther 5) #101, George Sisler 6) #83, Hugo Bezdek. Processing and shipping within the continental U.S. $25.00 plus 1.5% replacement cost insurance. 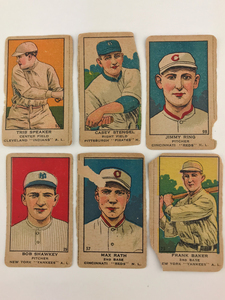 1919 W514 baseball cards comprising: 1) #90, Everett Scott 2) #49, Leslie Mann 3) #80, Dan Greiner 4) #79, Sam Rice 5) #62, Nap Lajoie 6) #97, Ira Thomas. Processing and shipping within the continental U.S. $25.00 plus 1.5% replacement cost insurance.